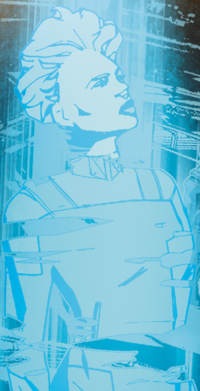 A woman with short slicked-back hair wearing a UNSC combat-ready uniform. Beatrix (AI Serial Number: BEA 2136-5) was a UNSC artificial intelligence construct active during the Human-Covenant War. Beatrix was stationed on a UNSC Marine outpost when it came under assault by Covenant forces. During the battle, the Covenant sent waves of Jiralhanae soldiers on a suicide mission to devastate the marines left inside the base. After another wave attack, Beatrix's power core was damaged and she was left running on failing backup servers. With her time short, she notified Sergeant Kress when she became the highest-ranking marine at the outpost and offered her assistance. As Sergeant Kress assumed command of the remaining troops, she instructed Beatrix to alert UNSC command to send them support. When the Covenant dispatched another wave of Jiralhanae, Beatrix informed Kress that they were heading to a breach in the base's western section which they could enter from. While the marines fought and fell to the Jiralhanae warriors in the section's corridor, Beatrix kept Sergeant Kress updated on the dwindling numbers of the facility's personnel. After being forced to retreat to a vehicle bay, Kress told Beatrix to shut up about their numbers and inquired if Command's reinforcements would arrive. Beatrix could only apologize to Kress before her backup servers failed and she perished, leaving Kress to deal with the Jiralhanae. ↑ Atriox used a Type-33 fuel rod gun during the battle. As this weapon was introduced in 2531, the battle must have taken place during or after this year.